I first read about ollas (pronounced oh-yah) over at Little Homestead in the City. 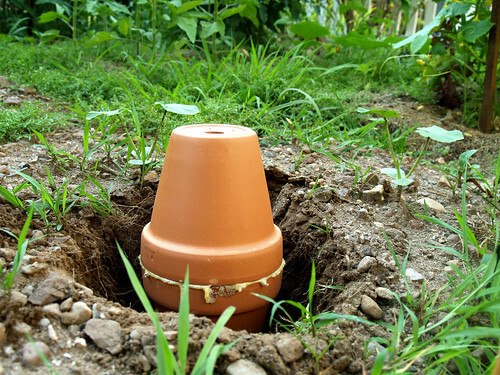 Basically it’s an ancient irrigation method that uses unglazed, porous clay pots buried within the root zones of plants. 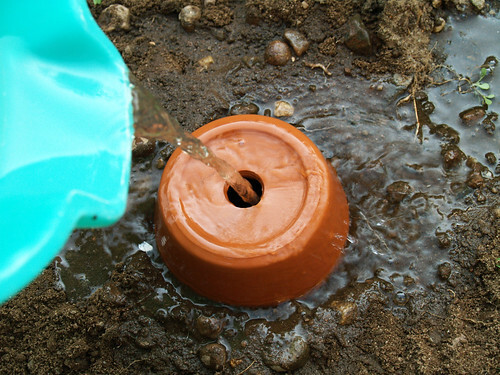 Water poured into the exposed necks of the pots (or pitchers) naturally seeps into the soil, providing a continuous supply of water to the plants. I’m intrigued by any method of watering that reduces consumption and is more natural. Ollas seem like the perfect answer, but premade ones can be expensive if you’re using them to irrigate everything. 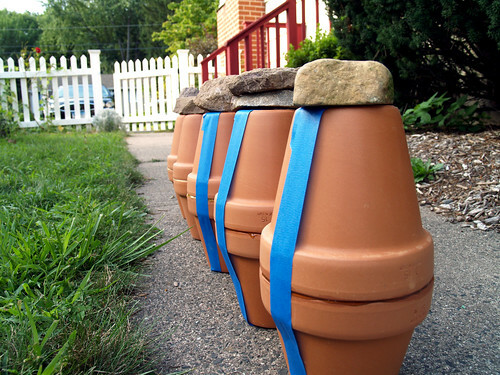 Then I found a gardener named Matt who posted an excellent how-to for making your own ollas using nothing more than inexpensive terra cotta pots. This time of year they’re easy to find, and I bought these 15-inch pots for $1 each at Job Lot. You don’t want water flowing out of the bottom of your finished product. Before gluing and stacking the pots, I sealed one drain hole using a 2×2 inch tile left over from a remodeling project. I should mention here that my adhesive of choice was Gorilla Glue. I debated buying silicone, but wanted to keep the experiment cheap, so I used what I already had. According to their Web site, Gorilla Glue is waterproof. It really couldn’t have been easier. The pots are stable in the center. With Gorilla Glue you have to put pressure on the adhesive while it cures. The best I could do was tape and rocks. It worked. As you can see, the glue expands when it dries, creating a water-tight seal. I chose to place this one near my young pumpkins. If the plants weren’t established, I would have planted seeds closer to the olla. However, digging around these delicate young plants was precarious, so I kept my distance. These ollas will hold approximately 3/4 of a gallon, so fill ’em up! You’ll need to keep something over the hole to prevent insects, rodents, and debris from getting inside. 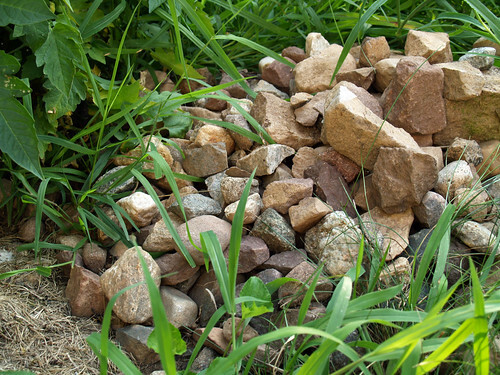 If you live in the Northeast, you probably have a handy rock collection. That’s it! It took me 24-hours to make five ollas, with most of the time spent letting the glue cure overnight. In climates with deep freezes, ollas probably won’t survive the winter. It’s best to remove them in the fall. I’m still experimenting with placement and numbers. I will monitor the moisture in the soil to see how far it penetrates. Just because the olla is empty doesn’t mean it needs to be refilled. Again, monitor the moisture of the soil. How are these working out for you? I live in the drought in Texas and this may work for me. What size would you suggest for tomato plants? I’m not using them this year because my garden has fallen by the wayside; pregnancy took over. I would suggest going big, and keeping them close to the plants. The ones I made were relatively small. Also, don’t forget to mulch. Grass clipping, hay, etc. will keep moisture in the soil. Good luck! A question: can the roots of the plant, as they grow stronger, break the olla pot? vegetables probably don’t have such roots, but trees or certain bushes do? I plan to bury them under the ground, entirely shut, with a small plastic pipe/hose for irrigation from a central reservoir. if one of the pot breaks, all the water will flood that spot. Have you noticed such a problem? will roots go around the pot or break it as they thicken? I have been doing some research kobi and what I have found out is that larger, more stronger roots can break the pots. Also I read that the pots should not be allowed to drop below 50% water because of salt build up or something of that nature don’t remember where I found it or what it said just know that it said don’t let it drop below that mark. FYI also found a site that claims that milk jugs work just the same by poking holes in them? Kinda curious if that works too. I think I may try both just to see. I use ollas, but I made mine with one pot and siliconed the matching saucer to the top. They’re smaller, but they work! A friend taught me how to do this cheaply. Take a soda bottle, cut holes in the bottom and bury. Fill the bottle as need arises. Boom. Moisture-happy plants. Really helpful post and a good idea. I have considered commissioning a local potter to make classic ollas, but this sounds a lot cheaper. Not a stupid question Flo. I’m learning myself and I found that Terracotta is very porous and will ‘ooze’ water but the pores are not large enough to let the roots grow into the terracotta. I, too, had seen them at the city homestead place. Theirs are out of our price range right now. Also, we live where the ground freezes. They will have to be taken out for the winter. We did something similar to what you did, but only used one pot, sealed at the bottom. We fill it and then have a quart sized bottle we fill and simply turn upside down into the pot with a couple small rocks in the bottom of the pot. It works on a water cooler principle, seeping out slowly. This is our first year using it, but it seems to work well. It will be easy to remove for the winter, and it is easy to know when it is out of water. 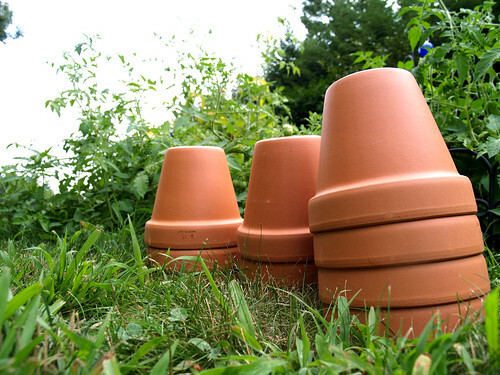 Assuming these are lead-free pots so as not to leach that stuff into your veggie garden, is there another type of adhsive that wouldn’t break down and into the soill if one is concentrating on growing organic? Anyone ever made these? I thought about it last year, but never got around to it… My hugelkultur beds already cut down on watering quite a bit, but I might throw a few of these in too! Awesome project! Summers can be droughty at times depending on how mother nature is feeling that season and these would be super stellar! Another great place to find cheap pots are thrift stores. I have quite a collection cuz you just never know…or maybe it’s an addiction…. This seems like a fantastic idea for a flower garden, however, I am gearing up for a large organic veggie garden. 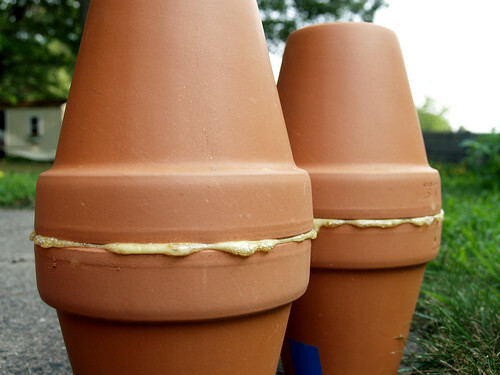 How did you determine if these particular pots would not leach out lead, and how harmful are the effects of Gorilla glue disintergrating into the soil? I’ve been saving my BPA-free gallon milk jugs to do the same thing as the hollas, but you do have to poke a few small holes into the bottom part of the jug before filling and burying. Plus they have a handy cap that prevents junk from getting inside the container. They work really well, and the plants growing next to them are happy. but there are some problems. you need to put those openings along the way too (every few meters for a 16mm pipe), unless you use a large pipe. the size of the pipe affects the flow (if i understand correctly the density is less when there is air contact) I’m not sure of the physics but those were my findings (I once tried and failed with a 150 meters pipe, since there were no openings along the way :-). you can consult Pascal’s law (pressure formula). 1. Transparency: if something happens for example the pot cracks, it’s hard to determine where it happens. I had an idea to put a little flag – a skewer attached to a cork inside, and colors or a flag outside so you can visually watch the water level inside the pot. but I hadn’t tried it. 2. Quite fragile: I used silicon for connecting, it’s fragile because you connect them with inner T, and connecting requires some movements. Perhaps a better idea is to base them on a siphon. then you just need to attach two pipes to the bottom (or use something heavy) of the pot. 3. green scum in the bucket or tank may reach the plant roots through the pots. If you want to clean the tank, you cannot use anything that would harm the plants. In my settings the tank (a large bucket) was fixed in place (dug in the ground) so I couldn’t take it out to clean or the entire system breaks. A siphon design would probably avoid that problem. 4. No digging: if you want to change a crop you cannot do that. This should be for groundcovers (think stinging nettles etc), perennials, large bushes or trees. By the way, it seems that the size of the pot doesn’t make that much a difference. I thought the moisture radius would change. but it’s all related to the soil density, so if it costs less, you can use small pots. Great tips and ideas, thanks! I might start small and see how it goes. I really haven’t had to water much with the set up I have, but it’s always nice to add more ways to use water efficiently! Great idea to focus water on the root systems. I used tiny pots – sold for crafts, weddings etc, with patio planters with great success – no watering even on hot days. (I give them a weekly liquid feed seperately though. Larger pots in the garden beds, fed with 6mm piping from a bucket, works too, but the plants need to get established first. Works well with french beans , mange tout, lettuce etc in pots, not so good with high demand plants like toms or cucumbers. A great aid to the daily grind of watering (which I no longer do) but I do feed pot plants with liquid fertiliser once a week and give them a good soaking then. 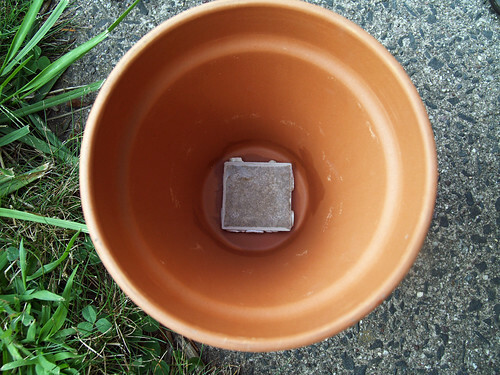 I read about ollas/clay pot watering just as I was planting my garden, so I put a few pots in the ground as “placeholders” that I would replace with the glued 2-pot olla. I put a metal pie plate over one, a plastic pot saucer over another. 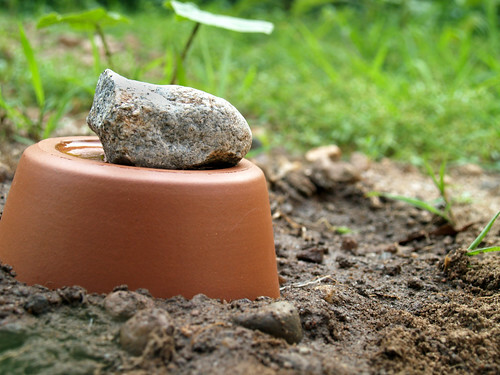 Put a plastic container or lid with a rock to hold it down over the drain hole. Then dislocated my shoulder so project over. These 2 pots hold water quite well, sometimes don’t need refilling for a week. I also used a shallower, wide pot in one of my raised beds & used it’s terra cotta saucer as a lid. This one needs refilling daily but I’m quite sure less water used than a drip system. I figure the water evaporates through the “lid”. Didn’t have time to get the drip system to the raised beds before injury. Filling the pot daily with a jug of water wasn’t too bad one-handed. Easier than dragging a hose around, dealing with kinks & catching on things. these plants grew larger, quicker than plants with the “ollas”that need infrequent filling. from other reading I have done, the olla is superior to a bottle with holes poked in it, or my water-to-root pots because they just pour the water into the soil, whereas the olla is self-regulating & won’t deliver more water than is needed. I hope to do something more sophisticated next year, but this year has been an interesting experiment. In this article, we will focus on debt settlements and how is it different from filing for bankruptcy. I thought this was a great gardening tip to conserve water. Could Olla be used to water a lawn? Hi, have found one amazing beautiful, and huge garden in the midst of an Indian city, with extremely dry climate. Had been watching it, and even in the worst drought it is all green, but i never see anyone watering it. 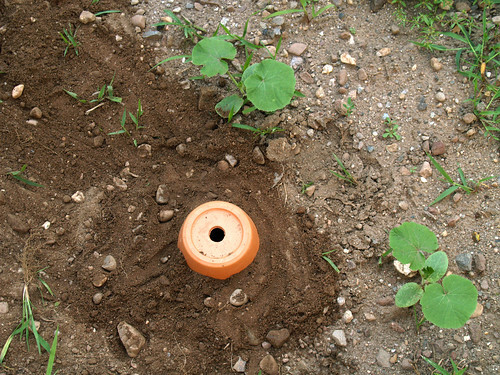 Curious about the garden, i went in there, and looked a bit around, and next to each tree there is a clay pot buried. The trees are already big enough to survive on their own, so probably whoever created this garden, does not need to water them regularly, actually the garden seems to be on it’s own. Maybe due to the clay pots somehow the trees are provided with water, and therefor stay green in the driest season. It may be due to condensation, that the pots provide the trees with necessary moisture. Happy to find some information about it on the web. Is absolutely brilliant technique. I have been researching an alternative to drip irrigation. I came across the concept of Ollas. This DIY is amazing and fairly cheap! Outstanding! How much space (diameter) have these pots been reaching? I’m thinking of getting a few 1,000 gal circular containers and curious how many of these guys I would need per container to keep my babies well watered. Thank you! For additional olla fun, keep an eye out at garage sales for clay wine cooler cylinders (These were filled with water and then, as water passed through the terra cotta to the outside and evaporated, the water (and the bottle of wine inside) cooled without refrigeration. There are no holes to plug, and if you are lucky you get the saucer that comes with the cylinder that you can use as a lid (or if you just search around there always is some round thing that will fit. Just make sure there are no gaps so mosquitoes get in. You do NOT want them. I made these today. Total time 5 minutes. Cost 2$ each. I’m very happy with them. There us no close spiget to the place I want to water. These will be great. I made smaller peat moss ones that will disinagrate over time for my windows boxes. It’s a wet day so why am I thinking about gardening with less water?